The savings after a year of badly paid jobs in Norway, a rich country with no real unemployment problem, by working double and sometimes triple shifts seven days a week. 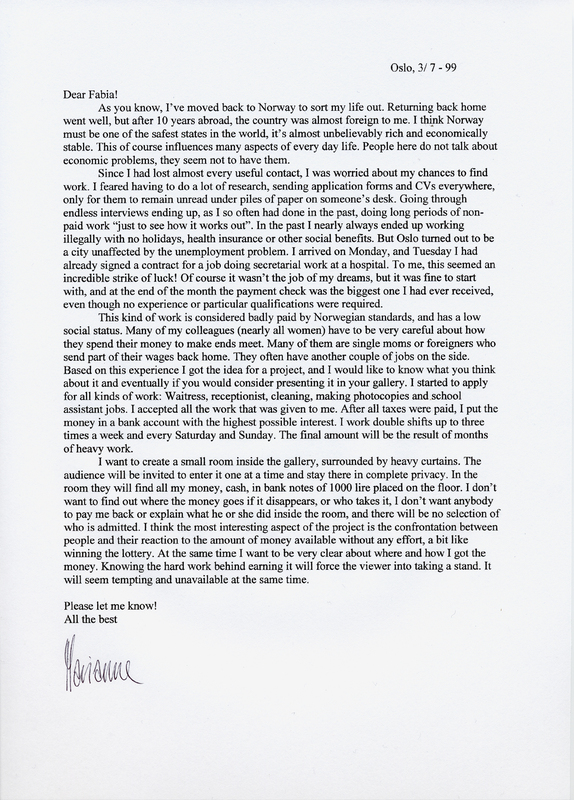 The money is earned from “honest work”, and is made available for the audience in the Italian gallery Fabia Calvasina in Milan. 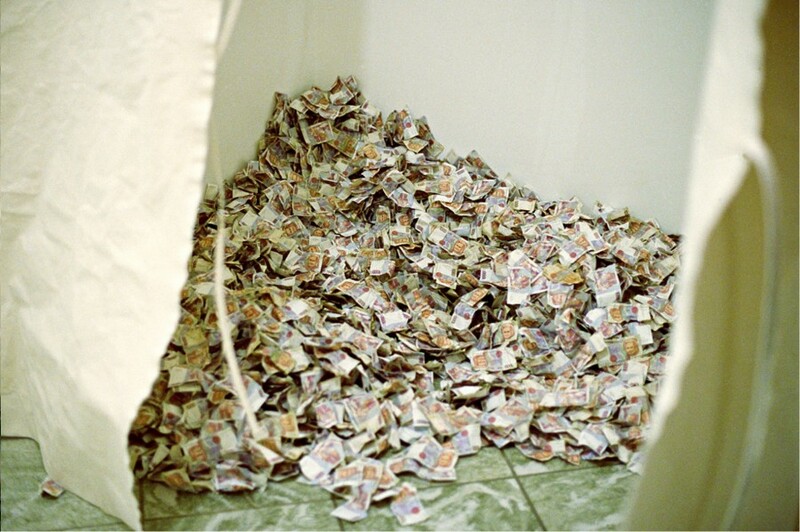 The audience is invited to enter a room closed by heavy curtains where the money is placed in cash on the floor. They enter the room one by one, and they can do whatever they want with the money. There is no form of control and the privacy behind the curtain is complete. 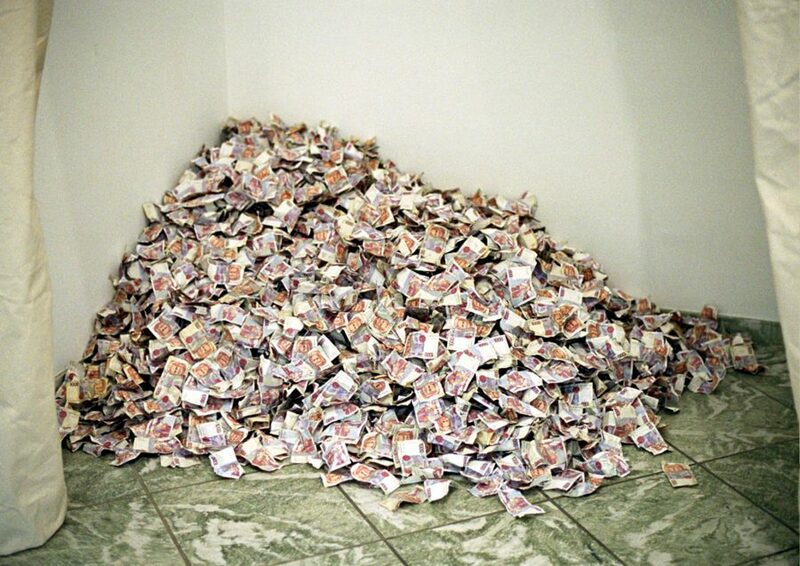 At the beginning of the evening there was 5.173.000 Italian Lire in the room. By the end of the evening (approx. five hours later) there was 4.947.000 left. Pengene er et resultat av 6 mnd. arbeid i lavtlønnede stillinger i Norge, et rikt land uten store arbeidsledighetsproblemer. Jobbene pågikk samtidig, og var organisert i en slags skiftordning. Pengene er tjent gjennom «ærlig arbeid», og presentert for publikum i det italienske galleriet Fabia Calvasina i Milano. Publikum ble invitert til å gå inn i rommet en og en, og lukke seg inne bak tunge gardiner. Pengene var plassert i kontanter på gulvet. Det var ingen form for kontroll, og publikum kunne gjøre hva de ville bak gardinene. Ved åpningen var det 5.173.000 Lire i rommet. Da galleriet stengte omtrent fem timer senere var det 4.947.000 Lire igjen.